Shower Plumbing by Kevin Ginnings Plumbing Service Inc. Whether you need a shower repaired or even installed from the ground up, you can depend on Kevin Ginnings Plumbing Service Inc. for every shower need. What if you don’t have an urgent problem? If your current shower just isn’t working for you, and you just want to change the water pressure or adjust your shower head’s height, call (816) 832-4322 to learn what we can do for you. In today’s economy, it helps to stay current on the latest developments in economical shower heads. These include timed shower heads, and shower heads with low water pressure. At Kevin Ginnings Plumbing Service Inc., we’re always looking out for ways to make your shower more efficient. We can also fix any shower problem under sun. We’ve been fixing showers since 1985, so our trained team of plumbing experts know how to diagnose and fix anything that could be wrong with your shower. A broken shower can completely derail your day-to-day life. There are several possible causes of shower problems. Your pipes may be clogged, or there may be calcium or lime deposits in your shower head. Whatever the problem may be, Kevin Ginnings Plumbing Service Inc. will be happy to help at any time, day or night. Whether you have an emergency shower need, or you just want to customize your shower experience, Kevin Ginnings Plumbing Service Inc. can help. 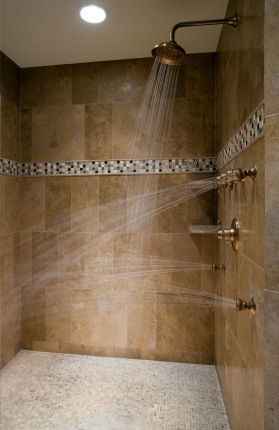 When it comes to showers, don’t have anything done before you call (816) 832-4322. Call today for a free quote!